Isabella Melvina Hinshaw1 [Isabella Melbine Hinshaw2,3, Isabel Hinshaw3,4, Isabell Hinshaw5]. Icel Cassity, born Apr 15 1878; died in infancy. Bertie Cassity, born Jan 13 1880; died in infancy. Bessie Cassity, born Dec 10 1882; married Everett C. Wilson. Roscoe Dale Cassity, born Apr 16 1888; died Dec 20 1941; married Burlie MacWilliams or Burlie Mae Villine. Casetty, James, age 28, born in Kentucky; farmer; cannot read or write. Casetty, Isabel M., wife, age 30, born in Missouri; parents born in North Carolina; keeping house; cannot read or write. Casetty, Etta, daughter, age 4, born in Missouri; father born in Kentucky; mother born in Missouri. Casetty, "refuse to give any name", daughter, age 4 months, born Jan  in Missouri; father born in Kentucky; mother born in Missouri. Cassity, James M., head-of-household, age 48, born Jul 1851 in Kentucky; parents born in Kentucky; married 25 years; auctioneer; owned farm. 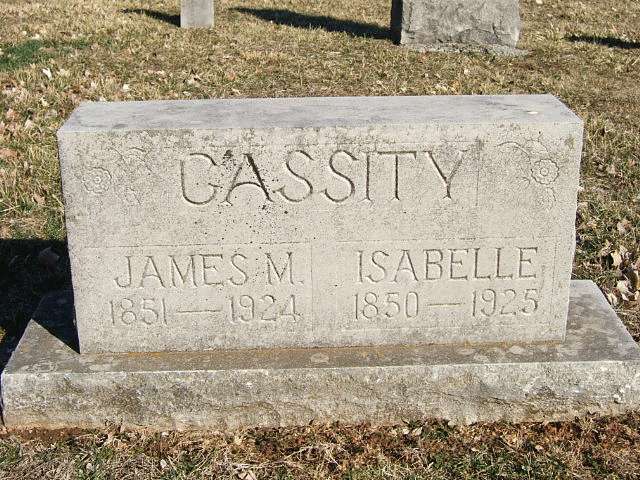 Cassity, Isabella M., wife, age 49, born June 1850 in Missouri; parents born in North Carolina; married 25 years; 5 children, 3 living. Cassity, Bessie, daughter, age 18, born Dec 1881 in Missouri; father born in Kentucky; mother born in Missouri; teacher. Cassity, Rosco, son, age 12, born Apr 1888 in Missouri; father born in Kentucky; mother born in Missouri; attended school. Cassity, James M., head-of-household, age 59, born in Kentucky; parents born in Kentucky; first marriage, married 36 years; "vetenarian" [sic]; owned home. Cassity, Isabella M., wife, age 60, born in Missouri; parents born in North Carolina; first marriage, married 36 years; 5 children, 3 living. Cassity, Bessie, daughter, age 28, born in Missouri; father born in Kentucky; mother born in Missouri; single; teacher, high school. Cassity, Rosco, son, age 21, born in Missouri; father born in Kentucky; mother born in Missouri; single; teacher, public school. Moore, John C., son-in-law, age 41, born in Missouri; parents born in Missouri; married 16 years; farmer, general farm. Cassidy, James M., head-of-household, age 68, born in Kentucky; parents born in Kentucky; owned home (mortgaged); occupation: veterinary, general practice. Cassidy, Isabell, wife, age 69, born in Missouri; parents born in North Carolina. James M. Cassedy, D. V. S.
Lawrence county is truly favored by being the residence of a man who is thoroughly versed in the various ills that the dumb animal kingdom is heir to. These poor creatures are unable to tell us their symptoms, so we have to make a careful study of their cases and the indications, together with the effects of the treatment, in order to be ever ready to administer to their ailments. Many times quick discernment and sound judgment as to what to do is necessary in order to save the animal's life. Oftentimes the animal is of much value and the skill of the veterinary is the only means of preventing a great loss. Again, an animal is valued for its achievements, or for other causes, which make it very desirable to preserve its life. A poor physician would be about as good as none at all. Dr. James M. Cassedy is a man well skilled in the treatment of our dumb animal friends, and his skill is known far and wide, his practice extending over into Kansas and other territory. Doctor Cassedy was born at Owensville, Kentucky, July 15, 1851. Thus, we note that Kentucky not only produces some of the best horses the world has ever seen, but also produces men thoroughly able to treat their various ills. He is a son of David and Elizabeth (McCormick) Cassedy. The father, David, was also born and raised in Kentucky, where he was a farmer and carpenter. He came to Lawrence county in 1870 and brought his family with him. There were twelve children, those surviving being George, Amanda, Samuel, Emily, James M., Elizabeth, Rudolph, William, Rachel and Ella. The mother died in 1903 and was followed by the father in 1907. James M. attended the public schools of Owensville until he was nineteen years of age, when the family came to Lawrence county. He was of a studious disposition and when but a boy took great interest in the various animals of the farm and especially those that were sick or wounded. He began the study of the veterinary profession very early and after mastering it thoroughly took the examination which he passed with high markings. He began the practice of his chosen calling in 1895. He has been unusually successful and has established a reputation for skill second to no one in southwest Missouri. In addition to his veterinary duties he has acted as auctioneer for twelve years, in which capacity he has given most excellent service. He is quite active in politics. His constituents made him township constable for seventeen years and for five years he was deputy sheriff. Notwithstanding all these duties he and his son operate the home farm and raise much stock. Etta, who is the wife of John C. Moore, has one child, Fay, to help them pass the time away; then came two daughters, both of who are deceased; then Bessie, now the wife of E. C. Wilson; and Roscoe, living at home. Doctor Cassedy is a member of I. O. O. F. Lodge No. 374, and also of Stafford Encampment, No. 381. He and his good wife are also members of the Order of the Daughters of Rebecca. Every live stock owner in Lawrence county has come to look upon Dr. Cassedy as an authority on the various ills to which livestock is subject and all feel secure in the knowledge that everything necessary will be done in any case to which he is called. Dr. James M. Cassedy (sic) was born in Owensville, Kentucky, on July 15, 1851, the son of David and Elizabeth McCormack Cassity. James M. lived in Owensville until 1870, when he and his family moved to Lawrence County. While a boy, he began to show considerable interest in the sicknesses of farm animals, and shortly thereafter he began the study of veterinary medicine, and duly passed the examination. On the 14th day of June 1874, he was married to Isabel Hinshaw, and three children were born to the couple. Cassedy began his chosen profession as veterinarian in 1895, and for the following several years was quite successful. 1880 census, Green Township, Lawrence County, Missouri; roll T9-698, ED 82, page 417B, line #34, dwelling #224, family #229. 1920 census, Miller, Lincoln Township, Lawrence County, Missouri; roll T625-932, ED 109, page 3A, line #3, dwelling #60, family #62. Posting Dec 24 2007 by Ross Cameron () to MOLAWREN-L. Posting Dec 15 2007 by Ross Cameron () to MOLAWREN-L.
1900 census, Green Township, Lawrence County, Missouri; ED 76, page 114A, line #20, dwelling #153, family #155. 1910 census, Green Township, Lawrence County, Missouri; ED 92, page 105B-106A (sheet 4B-5A), line #97, dwelling #95, family #95.